I am trying to set up an efficient office standard system for setting up Window and Door schedules using drawing templates, styled WinDoor objects, record info and worksheets. I have seen this recent thread. which is great however I am using WinDoor objects rather than native window and door objects so maybe the WinDoor experts might be able to help? This is all fairly new to me so any help or suggestions from anyone would be appreciated! 1) The actual schedule that would go on the Drawing sheet. 2) A "WinDoor Housekeeping" two-way report worksheet that can be used to edit the WinDoor objects quickly and efficiently. I like this as you can quickly pick up any inconsistencies in your doors & windows and correct them. This report would reside in the Resource Manager (not be put on an actual drawings). Is there a way I can show the WinDoor style of my windoor objects in a worksheet? It would be good to be able to cross check what style(s) are in use in a file. I can't find this as a record. The other thing is with the WinDoor user fields. The "Schedule Data" tab of the settings tab lets you use presets for the user fields. 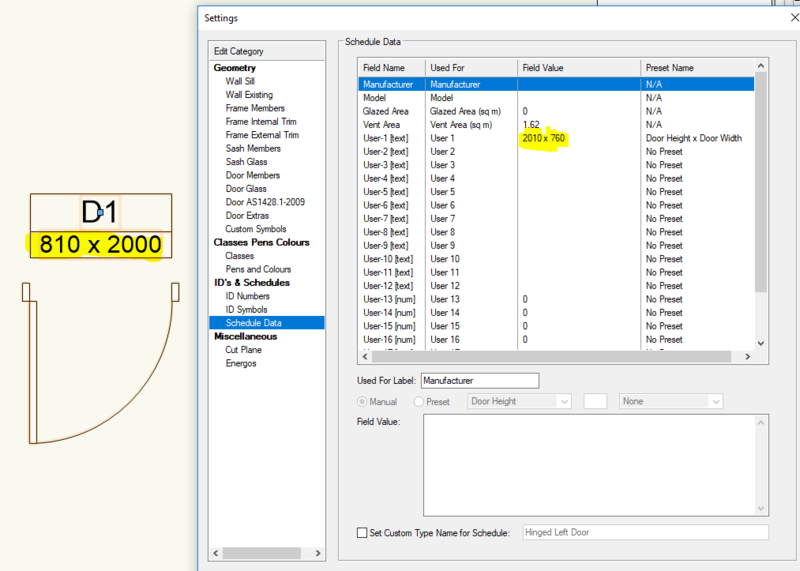 If I use the "Door Height x Door Width" preset for a user field it is picked up in the worksheet which is great however if I later edit the door size the preset value in the Schedule Data tab doesn't update (let alone update to the worksheet). Is this working as designed or am I missing something? I guess being a "preset" it is like a default initial value however the interesting thing is that for the ID Symbols if you use the second ID field for the same "Door Height x Door Width" the ID tags will auto update when you change the door dimensions. In the screen shot attached you can see the ID Symbol updated to an 810x2000 door but the preset value is still on 2010x760. To update the preset value I have to go into the settings dialogue of each WinDoor object one by one which clearly isn't what I want to do. 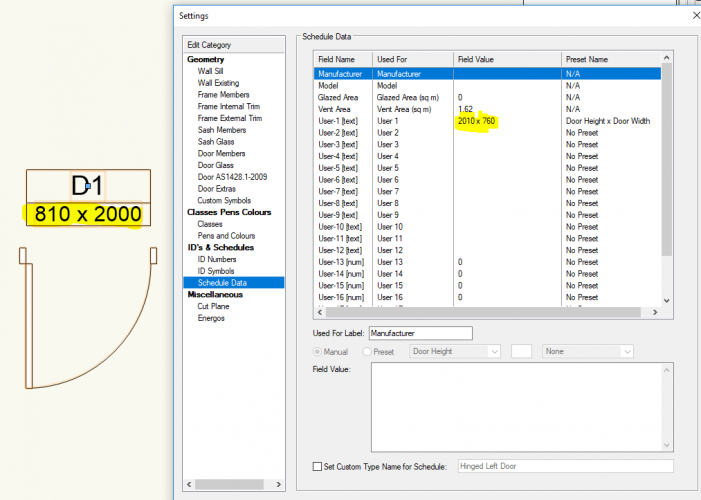 Is there a way to "reset" or "regenerate" WinDoor objects so these fields update? Unfortunately there is no "door height" record though there is a "door width" one which auto updates to the worksheets. Anyone want to take a bite at this? Can WinDoor styles be called up in a worksheet? Can the door width X height field be called up in a wksheet and (work two way). Is there a way to reset all/multiple WinDoor objects so the update to there revised settings. Also after playing around with door heights some more I've found that when the door threshold is not shown the door height versus overall height can be out by the thickness of the door sill frame. You need to open the form dialogue and close it again for the overall door height to update correctly. At the moment door height is too buggy to include as a record field in the door schedule, ( have to enter manually). Found this but no styles listed despite saying there are 126 objects that meet the criteria and I can't even type the name in. Any suggestions? So Ozcad have just posted a new movie on VW2019 WinDoor which I think addresses some of this. It looks like WinDoor styles have been improved in VW2019. I've played with WinDoor styles in 2018 and found myself going around in circles trying to edit them and control the instances of them on a drawing. I still don't know if they are buggy or its just me. I've decided to wait for the eminent release in NZ of the new vectorworks and see what happens.